The series opened on June 4, at the McNichols Sports Arena in Denver. Patrick Roy was in goal for Colorado, and John Vanbiesbrouck was between the pipes for Florida (a rematch from the 1986 Wales Conference Finals when Roy was with the Montreal Canadiens and Vanbiesbrouck was with the New York Rangers). Although Colorado was the heavy favorite in the series, Florida got on the board first on Tom Fitzgerald's goal at 16:51 of the first period. That would be all the Panthers would get, however, as Colorado scored three times within five minutes in the second period. Scott Young scored at 10:32, Mike Ricci scored at 12:21, and Uwe Krupp scored at 14:21. The Avalanche went on to win the game 3–1, with Roy making 25 saves in the victory. Peter Forsberg got the Avalanche on the board first in game two, scoring an unassisted goal at 4:11 of the first period. The Panthers tied the game on Stu Barnes' power-play goal at 7:52. Rene Corbet broke the 1–1 tie with a power-play goal at 10:43, and then Forsberg scored two power-play goals of his own at 13:46 and 15:05 to complete the hat trick. Colorado led 4–1 after just one period. The Avalanche would make it 5–1 with Corbet's second goal of the game at 4:37 of the second period. Valeri Kamensky followed with a goal just 31 seconds later, and Jon Klemm scored at 10:03 to give Colorado a dominating 7–1 lead after two periods. Klemm would add another goal at 17:28 of the third period. It was the Avalanche's fourth power-play goal of the game. Colorado won the game 8–1, with three players scoring at least twice. The Avalanche went to the Miami Arena in Florida with a 2–0 series lead. Claude Lemieux, back after his two-game suspension, scored the first goal of the game at 2:44 of the first period to give Colorado a 1–0 lead. Florida played determinedly, however, and tied the game on Ray Sheppard's power-play goal at 9:14. Rob Niedermayer scored at 11:19 to give the Panthers their second lead of the series. The score was 2–1 Florida after one period. At 1:38 of the second period, Colorado's Mike Keane scored a game-tying goal. Captain Joe Sakic scored the go-ahead goal just 82 seconds later, and Colorado went on to win 3–2 and take a commanding three-games-to-none lead in the series. Patrick Roy made 32 saves in the win. With their backs to the wall, the Panthers played a defensive game. Florida goaltender John Vanbiesbrouck went save for save with Colorado goaltender Patrick Roy. The two teams played a marathon game that took until the third overtime period. Uwe Krupp's unassisted goal at 4:31 ended 44 minutes and 31 seconds of overtime and gave the Avalanche a 1–0 win and a four-games-to-none series win. Goaltender Patrick Roy stopped all 63 shots he faced. Colorado outscored Florida 15–4 in the series, and Patrick Roy stopped 147 of 151 shots, for a save percentage of .974. Joe Sakic was awarded the Conn Smythe Trophy as playoff MVP, having led all skaters in goals with 18, and points with 34. For both Patrick Roy and Claude Lemieux, it was one of their three Stanley Cup wins in eleven years. Roy and Lemieux first won the Cup in 1986 with the Montreal Canadiens. Roy won a second Cup with Montreal in 1993. Lemieux won a second cup with New Jersey in 1995. Bolded years under Final appearance indicates year won Stanley Cup. In Canada, the series was televised on CBC. In the United States, this was the second year that coverage was split between Fox and ESPN. Fox broadcast games 1 and 3 while ESPN televised games 2 and 4. 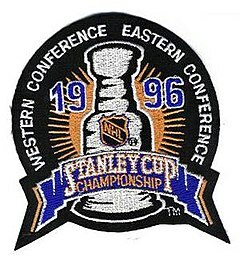 The Stanley Cup-clinching game thus aired on cable. Had the series extended, Fox would have televised games 5 and 7, and ESPN would have aired game 6. Sandis Ozolinsh was first Latvian born & trained player to win the Stanley Cup. Uwe Krupp was first the German born & trained player to win the Stanley Cup. The Avalanche won the Presidents' Trophy the following year. However, they fell to the Detroit Red Wings in the Western Conference Finals in six games. Colorado would not return to the finals until five years later by defeating the New Jersey Devils in seven games. The Panthers, on the other hand, lost to the New York Rangers in the first round, 4-1, and have yet to win a playoff series since.